St Mirren manager Oran Kearney is unsurprisingly unhappy with striker Simeon Jackson's fluffed Panenka penalty at 0-0. "We spoke before the game about the magnitude of the games and the pressure to make good decisions," he said on Sportsound. "I've said it to Simeon in there, and he's a big enough boy to take it, if we're 3-0 up in the first game of the season and there's 10 minutes to go, you can accept it. "But the magnitude of where we are at this point in time and how vital the start would have been for us, it's crazy. It kills us at one end of the pitch." 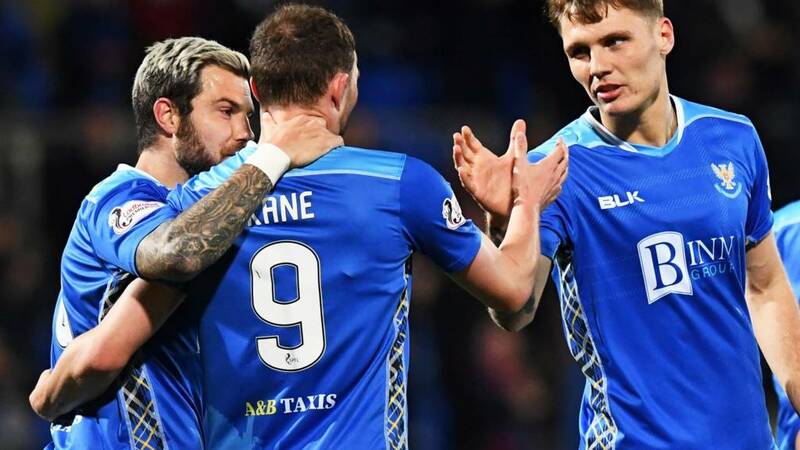 St Johnstone manager Tommy Wright is not too pleased with his team despite earning their first win in nine games. "Happy to win, the performance maybe wasn't what we wanted, there were too many mistakes," he said on Sportsound. "The key point is Zander Clark saving the penalty- I don't think it was a penalty. It was a great save from him and keeps us in the game and doesn't give them a lift. We forced more corners but we lacked a bit of quality." That result keeps St Mirren at the foot of the table, a point behind Dundee, their game in hand, gone. St Johnstone move up two places to seventh. Quote Message: St Mirren got better in the second half but didn't do enough. I felt St Johnstone were more comfortable and could have scored another through Murray Davidson. The game changed on the penalty miss. It deflated St Mirren and gave St Johnstone a lift, and they scored a few minutes later. St Mirren got better in the second half but didn't do enough. I felt St Johnstone were more comfortable and could have scored another through Murray Davidson. The game changed on the penalty miss. It deflated St Mirren and gave St Johnstone a lift, and they scored a few minutes later. Huge blow for St Mirren. St Johnstone though, keep their top six hopes alive. Tommy Wright's men have ended a run of eight league games without a win. As for St Mirren, they will rue that missed penalty by Simeon Jackson minutes before going 1-0 down. I imagine his teammates won't have taken too kindly to his Panenka attempt. They remain bottom and face Dundee at the weekend, who are a point ahead of them.What a game that is to look forward. It's lumped forward by St Mirren. Offside flag is up. That should be that. Three minutes of added time. St Johnstone have the ball in the corner. They win another corner. Repeat. That, is a horror tackle from the 17-year-old. With the ball running away from him he lunges and plants his studs straight on Richard Foster's shin. Fortunately, the St Johnstone full-back jumps straight back up. That, just about sums up St Mirren's night. Simeon Jackson takes a lovely touch and turn away from Joe Shaughnessy. He gets to the by-line but proceeds to blaze the ball into the stand. Grim. Can St Mirren move off the bottom? One goal would be enough to take St Mirren off the foot of the table as it stands. It's a St Johnstone corner though. Now it's St Johnstone's turn to come close. Tony Watt goes slaloming into the box but, bizarrely, he doesn't pull the trigger with his left foot and the defence recovers. St Johnstone defender Jason Kerr is alert to snuff out the danger as the ball broke to Simeon Jackson in the box. All hands to the pump for the hosts at the moment. Again though, the quality from St Mirren ultimately isn't good enough. This game is really opening up. Duckens Nazon expertly holds the ball up in the box, turns and fires a shot towards goal. It's blocked, but he gets it back, tees up Mihai Popescu but, typically, the centre-half blazes it over. Big chance gone for St Mirren. Big chance for St Johnstone to kill this game. Ross Callachan threads a delightful ball through to Murray Davidson, but his touch in front of goal is heavy and the chance is gone. Shortly after a corner comes in and it's cleared off the line by St Mirren. Quote Message: St Mirren have been better in the second half but it's not as if Zander Clark has had many saves to make. They need to commit more men forward. St Mirren have been better in the second half but it's not as if Zander Clark has had many saves to make. They need to commit more men forward. Duckens Nazon is in the mood tonight. The big striker batters towards goal and shifts the ball on to Paul McGinn, but the St Mirren full-back's pass goes astray and St Johnstone clear. Matty Kennedy is off for St Johnstone, Tony Watt comes on up front.